"Hunger and malnutrition are unacceptable in a world that has both the knowledge and the resources to end this human catastrophe.... We recognize that globally there is enough food for all and... pledge to act in solidarity to ensure that freedom from hunger becomes a reality." 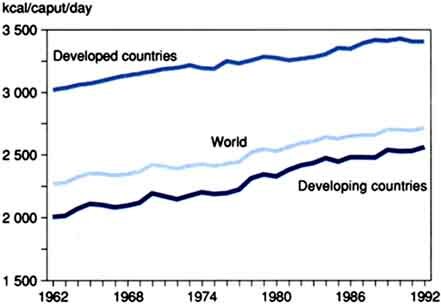 Fifty years after the founding of the Food and Agriculture Organization, global food production has increased steadily and a substantial decline in the prevalence of undernutrition has occurred (Figure 1). Despite this progress, FAO estimates that more than 800 million people do not have access to enough food to meet their basic daily needs (Figure 2). In addition, more than 40 percent of the world's entire population, 2 000 million people, have deficiencies in one or more micronutrients. Recognizing the gravity of this situation, FAO and the World Health Organization (WHO) convened the first global conference devoted solely to addressing the world's nutrition problems, the International Conference on Nutrition (ICN), at FAO Headquarters in Rome in December 1992. Representatives from 159 countries and the European Community, 15 United Nations organizations and 144 non-governmental organizations (NGOs) participated. For the three years leading up to the ICN, intense preparatory activities were undertaken throughout the world. Governments prepared papers describing the food and nutrition situation within their countries, the factors influencing the nutritional status of the people and the groups within the population that were vulnerable to nutrition problems. State-of-the-art technical papers were prepared for the conference, and experts, policy-makers and planners from around the world participated in regional and national meetings. At the August 1992 Preparatory Committee Meeting held at WHO Headquarters in Geneva, government representatives considered the draft World Declaration and Plan of Action for Nutrition, which was finalized and adopted unanimously at the ICN later that year. During the ICN, governments pledged to make all efforts to eliminate or reduce substantially, before the next millennium, starvation and famine; widespread chronic hunger; undernutrition, especially among children, women and the aged; micronutrient deficiencies, especially iron, iodine and vitamin A deficiencies; diet-related communicable and non-communicable diseases; impediments to optimal breast-feeding; and inadequate sanitation, poor hygiene and unsafe drinking-water. · assessing, analysing and monitoring nutrition situations. Many governments, non-governmental organizations (NGOs) and international agencies have maintained the momentum created by the conference. Each in its respective realm of work is striving to carry out the commitments made at the conference, and many are undertaking new initiatives. One of the outstanding results of the ICN has been the preparation of National Plans of Action for Nutrition (NPANs). As of May 1995, over 73 countries had finalized or revised draft NPANs, while another 20 countries were still in the early drafting stages. The NPAN represents the country's particular priorities and strategies for alleviating hunger and malnutrition. Most NPANs are designed to direct countries, donor agencies and NGOs in project and programme implementation. They also serve as a mechanism for mobilizing political and funding support for food and nutrition programmes. For many countries the NPAN includes budget allocations and timetables for project proposals. Other countries have integrated the NPAN into national development plans in order to ensure national support. FAO member countries have indicated that the NPAN process has been invaluable in advancing nutrition issues to the forefront of national development agendas and in meeting the overall goals of the ICN. National workshops for NPAN development have included representatives from government ministries, NGOs, private industry, universities and international agencies. The strengthening of intersectoral cooperation among those organizations working on nutrition-related issues is another noteworthy outcome of the ICN. In many cases, this cooperation has been institutionalized through multisectoral committees in which representatives from ministries of agriculture, health, education, planning and other sectors have combined efforts to develop comprehensive integrated programmes for improving nutrition. FAO has had a fundamental role in complementing national initiatives following the ICN. The Organization has provided technical assistance in NPAN development and ICN-related activities to 92 countries. To enhance and supplement the technical assistance, FAO has provided over US$1.5 million in funding assistance for national workshops, project implementation, national consultants and other ICN-related activities. In supporting these efforts, FAO has concentrated on the areas of technical expertise within its mandate: promoting household food security and community development; ensuring the quality and safety of food supplies; combating micronutrient deficiencies; promoting nutrition education; assessing, analysing and monitoring food and nutrition situations; and incorporating nutrition objectives into development activities. Food security is a high priority for FAO as the largest of the UN specialized agencies and the one assigned the role of improving the food and agriculture sectors. The ICN focused on food security at the household and community levels and helped to make more explicit the linkages between nutrition and agricultural development. FAO is promoting agricultural development to increase food consumption and provide income to reduce poverty. In light of the challenges facing countries and the international community in their efforts to obtain lasting food security for all, FAO will convene the World Food Summit in 1996, at which heads of State will deliberate the pragmatic and concrete measures needed to achieve this goal at the national, regional and global levels. As FAO reflects on its 50 years of existence, the ICN may be regarded as one of its most significant accomplishments. A set of principles has taken root and a process has been set in motion, with the global community working together to ensure that all people have access to nutritionally adequate and safe foods throughout the world. Through the ICN, FAO has reaffirmed its commitment and is fulfilling its obligation to those individuals for whom the Organization was established.